5/20: A very special SketchPad episode: The Psyche and Cupid Radio Hour in collaboration with writer & animator Dilsa Perençick phoning in from Finland. 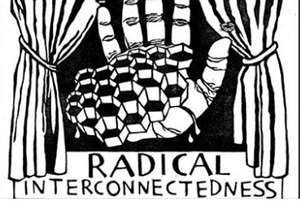 4/26+27: Strange Radio comes to my home town, Great Falls, MA as part of the Radical Interconnected Fest with Eggtooth Productions. Live sound documentary perfomance! By candlelight in an old church. Details coming soon. 3/26: ​ Guest speaker in Soundscapes: An Exploration of Identity through Music and Sound, taught by Professor Yvette Janine Jackson, Amherst College, Amherst, Massachusetts. 3/25: Strange Radio as Method, public talk at Center for Humanistic Inquiry (CHI), Amherst College, 4:30-6:30pm with reception. 3/18-20: Dirty Ear Forum, Vienna, Austria. As part of this I'll be teaching a radio autoethnography workshop in Hörvergessen, a seminar taught by artist Ricarda Denzer at Universität für Angewandte Kunst Wien/ University of Applied Arts Vienna. 3/7-3/11: A visit to Stockholm's EMS (Elektonmusicstudion) with Yvette Jackson. A Radio Art Workshop in Helsinki, Finland, as part of sound art festival ÄÄNIAALTO. All welcome, all levels. 2/24: Opening of TONSPUR_collaboration: Yvette Janine Jackson (USA) / Bojana Knežević (SRB)/ Katarina Petrovic (SRB) / Karen Werner (USA): A Chance Encounter (for 4 artists, 8 speakers and 16 questions). 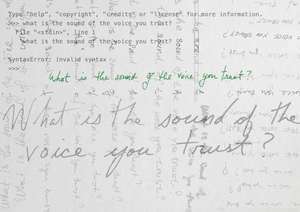 A sound installation about trust, Vienna's MuseumsQuartier Tonspur Passage until April 27. 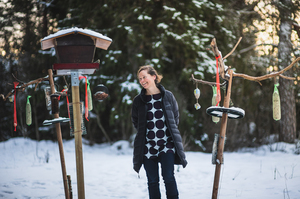 1/7/19-2/28/19: Two month art residency at Saari Residence - Kone Foundation near Mynämäki (southwest) Finland. 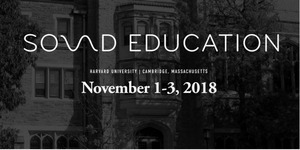 11/2-3: The Politics of Storytelling // Arts and Culture Podcasting: Presentatons at Sound Education: A Conference for Educational Audio Podcasters & Listerners, Harvard Divinity School, Cambridge, MA. 10/22: SketChPad launches! 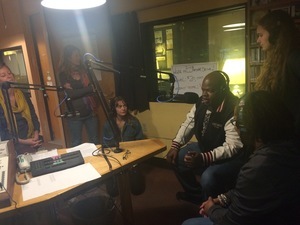 Biweekly radio show on WMCB 107.9fm, Greenfield, MA. Mondays Noon-2pm, live streaming here. SketChPAd is a sonic zine about creative radio making. Archived shows are here. Sharing my slot with EE Miller, so every other week you'll hear her fabulous show Death Jewel. 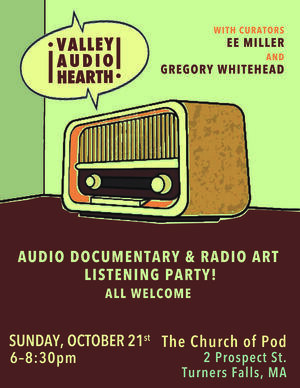 10/21: Audio Hearth with co-curators Gregory Whitehead and EE Miller. Held at Pagan's Church, Great Falls, MA 6:30pm, all welcome. This will be divine! 10/21: Haus part 2, Zirkus opens as an 8-channel sound installation in Maribor, Slovenia, in a space curated by Tonspur Kunstverein Wien. 10/13-14: International Festival of Computer Art in Maribor, Slovenia. 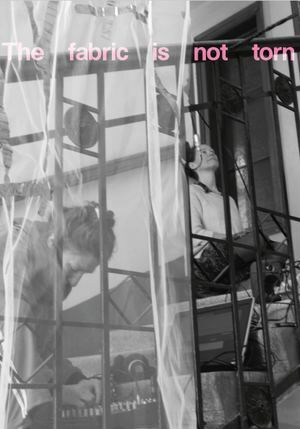 Collaborating with the feminist Serbian podcast FEMKANJE (Bojana Knezevic and Katarina Petrovic) and U.S. composer Yvette Jackson on A Chance Encounter, an 8-channel sound installation about trust. 10/1-12/31: Honored for Haus parts 1 & 2 to be featured on online audio platform Earlid, including Q& A with Earlid's instigator Joan Schuman. Check it out here. 9/21-12/1: Radio Art: Listening to the Deep Connection, Launching group study in Goddard College's new BFA in Socially Engaged Art. We riffed live on Goddard's radio station WGDR about radio, listening, and the body/ absent body. Listen here. 6/10-10/13: Haus, part 1: Covenant of the Tongue plays in Maribor, Slovenia at Tonspur's sound passageway at Maribor's Town Hall. Beneath a balcony where Hitler spoke in 1941, the air reverberates with Kabbalistic chanting of the "three mothers" of the Hebrew language (aleph, mem, and shin.) Plays daily 10am-8pm, curated by Georg Weckwerth. 5/30: Andrew Leland and I are reviving Valley Audio Hearth and we co-curated a listening sessions on Wed. May 30th. The space was packed, and we will do more soon. 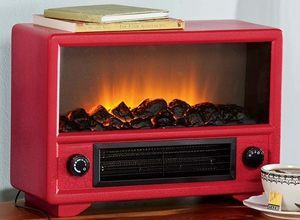 Audio Hearth is a bimonthly (or so) gathering for audio makers, documentarians, artists, writers, sound lovers, journalists, and radio fans to listen, discuss, and spend time together. Iconica Social Club, Northampton MA, 7-9pm. All welcome, free. 5/28 - 8/28: Haus, part 2: Zirkus is an 8-channel sound installation at Tonspur's MuseumsQuartier sound passageway in Vienna this summer. Playing daily from 10am-8pm. ​Georg Weckwerth (photos), Astrid Seme (graphic design) and I collaborated on a new series of seven images that are in the passageway as part of the installation. 5/20-24: Jetzt Höre Ich/ Now I Hear at International Features Conference - Prague, Czech Republic. 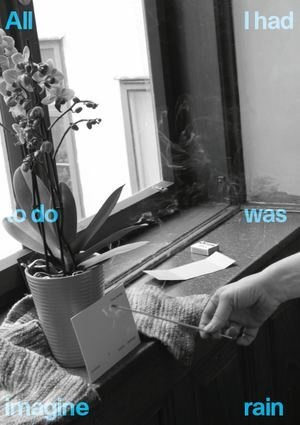 Part of a selection of radio pieces curated by Viola Jezkova. I haven't yet been to IFC in person and am honored that a part of me got to be there this year. 5/16: International Congress of Qualitative Inquiry (ICQI) Autoethnography Special Interest Group presentation, "Working Collaboratively" with Deanna Shoemaker, panel at University of Illinois, Urbana-Champaign. 5/21: Invited by Wave Farm WGXC in Acra, NY to make 28-minute radio art piece to be broadcast in May across the Radia network on radio stations in Germany, France, Canada, Austria, Australia, Belgium, New Zealand, Slovenia, Netherlands, England, Estonia, Italy, Norway, Portugal, Macedonia and Luxemburg. 5: Duet for 4 Feet, (Im)mobile Poetry, audio piece made with Deanna Shoemaker for ICQI Mobile Poetry podcast. 4/30: Presentation of Strange Radio at Hampshire College course, "Responses to the Holocaust" with Prof. Jeff Wallen. 4/22: O1/ORF Kunstradio broadcast of Haus, parts 1 and 2 plus excerpt from Strange Time(s). Listen here. 3/24: Guest artist in "Hörvergessen," a seminar taught by artist Ricarda Denzer at Universität für Angewandte Kunst Wien/ University of Applied Arts Vienna. Experimental Radio Autoethnograpy! Listen here. 3/21-3/23: Ghost's Radio workshop and live broadcast, a project of the Mobile Art Lab residency, Academy of Fine Arts, Katowice, Poland. Ghosts Radio, Episode 2. Listen here. 3/20: Politics of Storytelling presentation at Prix Bohemia Radio Festival, Olomouc, Czech Republic. 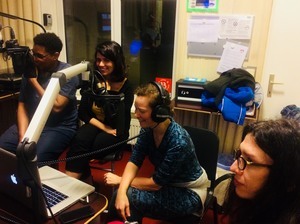 3/15: Radio Autoethnography workshop and live broadcast with students in the PhD-in-Practice program, Akademie der Bildenden Künste/ Academy of Fine Arts Vienna. Broadcasting work on Radio Orange 94.0FM from 7-8pm. Archived here. 3/12: Guest artist for graduate production course, Radio Experiments, Prof. Joan Schuman, New School for Public Engagement. 3/7: Guided tour of MAG3 projectroom exhibition, beginning at Novaragasse 40. Plus, a special performance from the Chief Cantor of Vienna Shmuel Barzilai and Stadttemple Choir Director and musician Benjy Fox-Rosen. Projectroom MAG3 | Schiffamtsgasse 17 | 1020 Vienna. 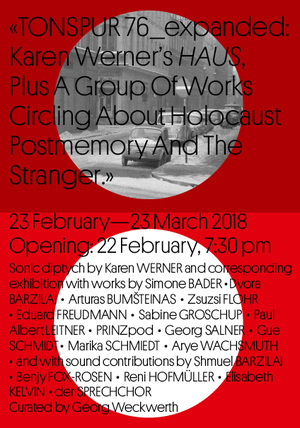 2/24: Interview by Frank Jodicke about "Karen Werner's HAUS Plus A Group Of Works Circling About Holocaust Postmemory and The Stranger" in skug MusikKulture, read here. 2/22-3/23: Haus, part 2: Zirkus. Sound installation, central piece in gallery show at projectroom MAG3 | Schiffamtsgasse 17 | 1020 Vienna. Opening event on Thursday, February 22, 2018, 7:30pm. Introduction from Dr. Felicitas Heimann-Jelinek and welcome from mayor of L-stadt, Uschi Lichtenegger. 2/20: Interview with Ilan Stavans on NEPR's In Contrast: A Podcast on Culture in the Making. Wendy Call and I talk about our ABC/RN radio documentary, You Will Not See Me Die. The episode is really great. You can hear Zapotec Language and the Language of Radio here. 2/9: Swimming Through Butterflies featured on Constellations podcast. Listen here. 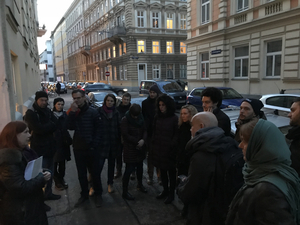 12/3: Haus, part 1: Covenant of the Tongue, Tonspur MuseumsQuartier sound passageway installation, Vienna, Austria, through February 24, 2018. Opening event at 5pm at MQ. Introduction by Dr. Felicitas Heimann-Jelinek, former Chief Curator of the Jewish Museum of Vienna. 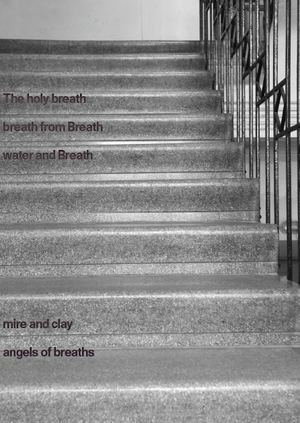 Hear Haus, part 1: Covenant of the Tongue here. 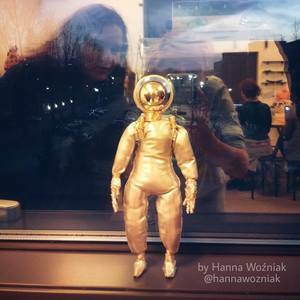 11/23: Ghost's Radio: Art, Research, Possibilities. 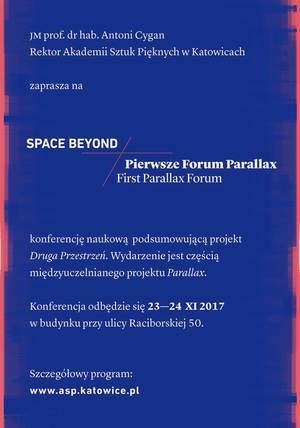 Invited presenter at Spaces Beyond: Parallax Forum Network, an international conference on the role of the art academy, hosted by Academy of Fine Arts in Katowice, Poland. 11/21: Broadcast of You Will Not See Me Die on Earshot, Australian Broadcast Corporation. 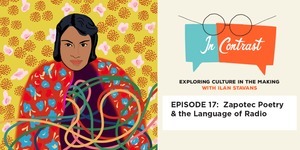 30-minute documentary co-produced with Wendy Call about Zapotec poet Irma Pineda, hip hop artist Tono MC, and the vitality of the Zapotec langauge in Mexico through poetry and music. Listen here. 11/19: The Art of Postmemory, presenting workshop at Limmud Wien, Vienna, Austria. 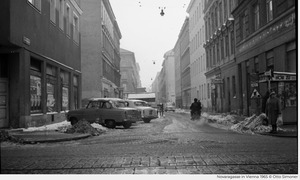 VHS Polycollege Margareten Wieden, Stöbergasse 11-15, 1050 Wien. 11/9: 1-hour broadcast of my radio pieces on the two-week radio station and project Radiophrenia, Glagow, Scotland. My work is included as part of Meira Asher's nightly programming from her radioart106FM vaults. 11/1-30: Tonspur Artist-in-Residence at MuseumsQuartier, Vienna, Austria. 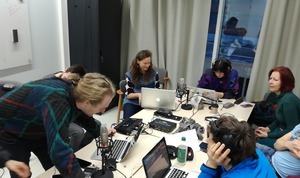 10/25-27: Presenting Ghost's Radio, a two-day workshop in Vienna under the auspices of the Mobile Art Lab of the Academy of Fine Arts in Katowice, Poland, and Radio Orange 94.0FM in Vienna. Wonderful experience. Archived here. 10/1-5/1: Memorial Foundation for Jewish Culture Fellowship for Strange Radio. 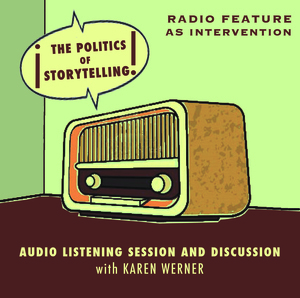 9/29-10/1: The Politics of Storytelling, Contributor at HearSay International Audio Arts Festival, Kilfinane, Ireland. 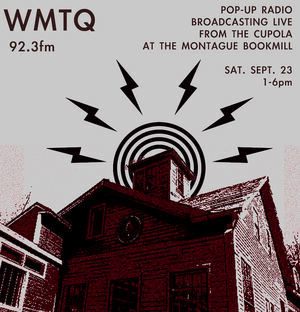 9/23: Broadcast #1 of WMTQ 92.3FM, 5-hour microtransmission from the cupola of the Montague Bookmill. 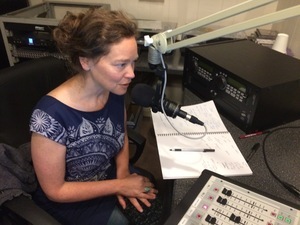 9/16-17: The Politics of Storytelling, Presenter and featured artist, Megapolis Radio Festival, Philadelphia, PA.
7/29: Interview on Wave Farm's WGXC-FM Acra, New York about Strange Radio. Archived here. 7/1-9/15: Radio's Art contributor -Earlid's online forum about audio & radio criticism. An archived pdf of the forum is available here. 5/20: Strange Radio: Performance Autoethnography and Radiophonic Space, paper at the International Congress of Qualitative Inquiry, University of Illinois, Urbana-Champaign. 5/17: In Praise, In Praise of the Radio Autoethnography, WEFT radio broadcast performance for Autoethnography, Activism and the Public Sphere: Taking it Public, International Congress of Qualitative Inquiry, University of Illinois, Urbana-Champaign. 3/30-6/30: Seaweed on Earlid's online sound art exhibit, Right Ear Dominant, curated by Joan Schuman.